Professional Liability is also known as malpractice coverage or errors and omissions (E&O) coverage, covers liability for damages arising from the rendering of or failure to render professional services. It protects you and your company in the event a client alleges they have suffered a financial loss as a result of an error or an omission committed by you in the delivery of your professional services. Professional Liability covers your organization, your professionals and/or employees in the course of providing professional services to your clients. Professional Liability insurance pays covered damages and also pays for defense costs. General Liability is one of the core types of commercial insurance and covers liability claims of bodily injury or property. The coverage offers Premises and Operations Liability which protects your company against liability for conditions or activities arising out of the premises or operations of your company. Directors and Officers Liability provides financial protection for the directors and officers of the company in the event they are sued in conjunction with the performance of their duties as they relate to the company. Think of Directors and Officers Insurance as a management Errors and Omissions policy. A company’s directors and officers can be sued over their management decisions by a whole host of constituents. The primary feature of excess / umbrella protection is to provide an additional amount of liability insurance, that is excess over underlying policies such as general liability, professional liability, automobile liability, and employers' liability. 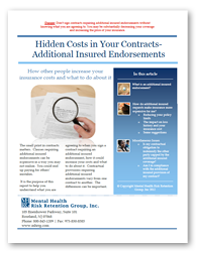 The additional coverage applies when the limits of insurance on an underlying policy are exceeded. For instance, if you have $1,000,000 coverage under General Liability and you have a claim settlement for $1,500,000 the excess / umbrella policy would pick up the additional amount. Workers Compensation is used to comply with the Workers' Compensation Coverage required by your state law. Under this requirement, an employee can be compensated if he or she is injured while working for you, regardless of your negligence as an employer.